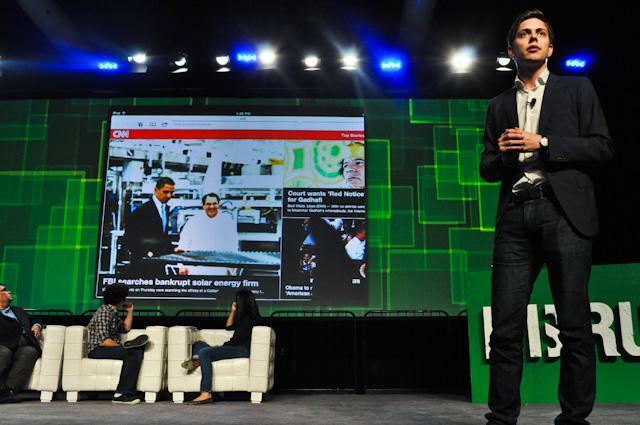 TechCrunch Disrupt finalist Pressly is an HTML5-based platform that turns online publications into tablet-friendly websites that work on the iPad, Android tablets or the BlackBerry PlayBook. The sites it produces are nearly indistinguishable from their native counterparts, like Flipboard and Zite for example, offering a similar experience for browsing through articles, images and videos. Navigation is designed for the tablet interface, using common gestures like multi-touch swipes and pinches. Pressly’s platform includes five customizable templates as a starting point, each designed with the needs of different publishers in mind. One template is more text-driven, while others are better for browsing through photos or videos. Like native apps, navigating a Pressly-built site uses intuitive gestures, like a 2-finger swipe up or down to reveal quick navigation and a pinch to close articles. The templating engine can pull in a variety of data feeds, too, like JSON, XML, RSS or Twitter and WordPress content. Despite the end product’s similarities to today’s popular tablet magazines, Pressly isn’t designed to be an alternative to building a native app for the iPad or another tablet. In fact, the company isn’t even a big proponent of saving URLs as homescreen icons. Instead, Pressly wants to leverage the popularity of tablets’ most popular application, the browser, to immediately deliver tablet-optimized experiences to those surfing the Web. In addition, because these sites are just HTML pages, publishers can integrate all the common functions found in a traditional website, including analytics, advertising, payment processing, store finders and more. And Pressly includes its own ad platform which lets publishers and advertisers insert rich media ads into the tablet-friendly site. These ads can include videos, photos, links, hot spots, social sharing buttons, detailed tracking mechanisms and they can even be displayed as 360-degree immersive views. Pressly is currently working with Canadian Living Magazine, Transcontinental Media Group and The Toronto Star (Canada’s largest daily) as well as with the The Economist’s digital team in New York on a new, yet-to-be-announced product prototype. If you’re on a tablet computer, you can see a demo of Pressly in action here. The company’s founders include CEO Jeff Brenner, CTO Peter Kieltyka, Marketing and Media Lead Tobin Dalrymple and Business Development Lead Chi Chen. Brenner and Kieltyka previously founded a consulting business called NuLayer, which built over 17 successful Web and iOS projects including the popular sports app for theScore, as well as social photo sharing startup Crowdreel, winner of the 2009 Twitter Chirp conference. NuLayer has a minority partner in theScore, but Pressly itself has no direct funding. Pricing for the platform has yet to be determined. AL: Really beautiful. Need to focus on certain verticals. A: We feel publishers need this. 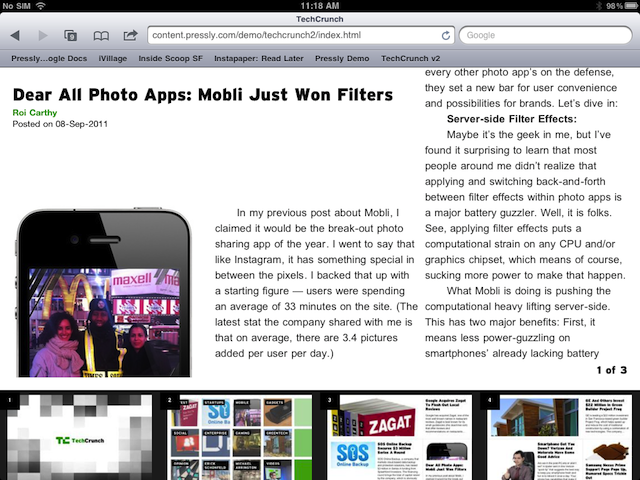 This isn’t competing with Flipboard directly. 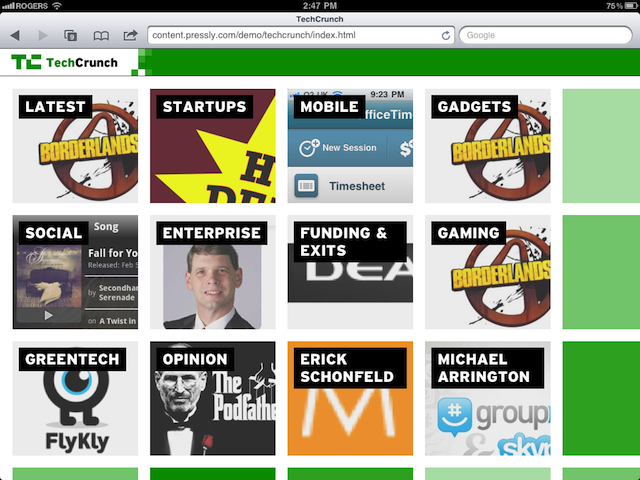 DM: I’m Flipboard investor, not sure your product is there yet. A: Flipboard is iPad . Pressly is a Web tech (HTML5). Also, publishers can control content better. There’s room for us. 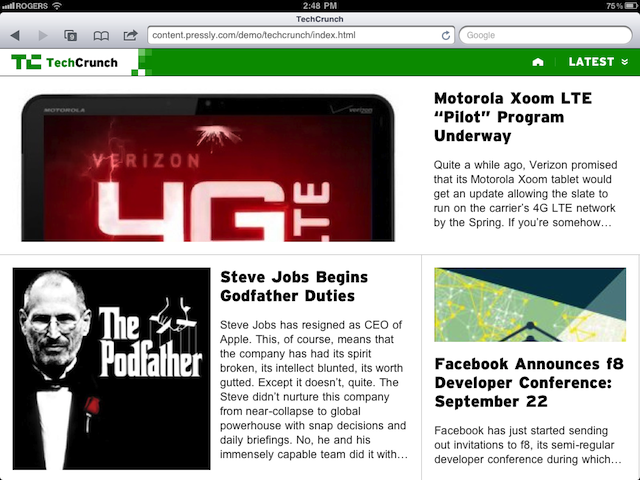 Flipboard does content discovery on iPad, Pressly uses Safari or a Web browser to deliver tablet-friendly site. MP: From user perspective, looks great. Biz model question about revenue share. A: No upfront costs on revenue share with publishers – a win-win situation for both. If consumers love and is engaging, publishers can increase CPM’s. Can start bringing ad inventory to publishers. JS: I like the ads. Worry is people with dev shops can build whatever they want, leaving you with newspapers, those without tools to build this. A: Built platform where publishers can build on top of. Publishers are good at telling stories, not great at innovating like this.